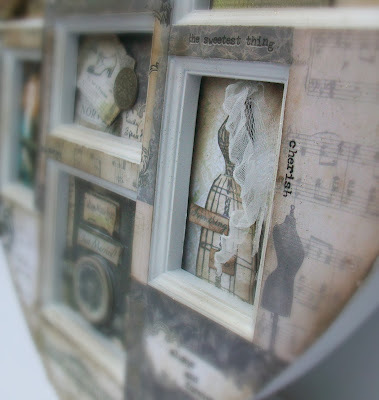 Eclectic Paperie: Altered Frame with 7 Gypsies Harmony Paper Collection . 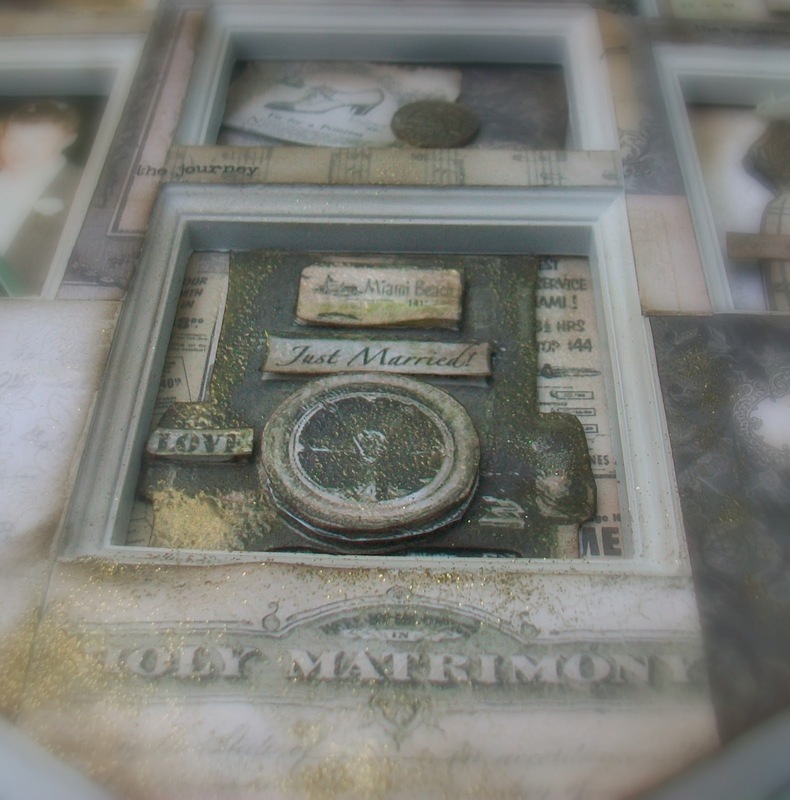 . .
Altered Frame with 7 Gypsies Harmony Paper Collection . 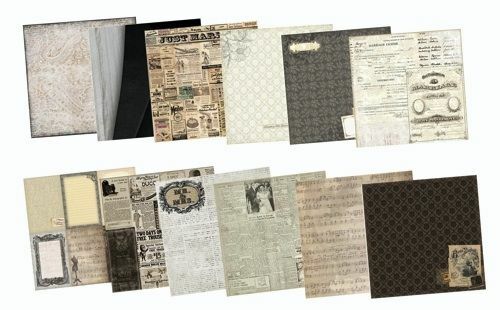 . .
Oh my giddy aunt I can`t begin to tell you what a joy it was to get back to my love of pretty papers!! I adore vintage and shabby along with papers that tell a story and this collection does it all. I actually remembered to take a picture of the frame before I started, if you know me you might know how impatient I am to get started on a project and tend to forget . . . not this time though,yeah! See how cheap it was . . . oh my did I get a bargain. The papers come in an 8x8 paper pad with 48 sheets and are double sided giving you lots of paper to play with. All the embellishments that you are going to see are made from the papers with a little touch of Distress Ink and Embossing powders. You get so many of each design that you can afford to cut out the car a few times to layer it up for more dimension using foam tape cut to size. Like wise with the dress form . . . snip, snip, snip . . . I used the square of paper with the original dress form and then snipped it out twice more, snipping of the skirt for the top layer. Ahhhh see the teeny tiny veil . . . off cuts off ribbon found in my stash, they make me happeee! This one holds a special meaning for me . . . my Auntie Jessie gave me this three pence on my wedding day to pop in my wedding shoe for good luck ... a sweet memory of a much loved Auntie who is no longer with us. Ever get the feeling that these papers where made for this project, I could hardly believe it when I saw the papers with the advert for the shoe! cut me...cut me... So I did, lol. This one has a story to tell and was my 2nd attempt at making it look old . . . Okay so I`m out in my wee shed and had chopped this one to the size I needed, but I wanted it to look like it had been around for ever soooo what did I do,hmmmm? Well, I went and found myself a lighter and fired it up, held it under the paper and swoooosh it kinda went on fire...imagine me oooh aaahing, going noooooooo, waggle, waggle..tried to throw it out the door but it was windy and blew right back in landing on the mat..sparks, sparks..arrrghhhhhhhhhhhh....oh my giddy aunt did I panic,I mean my shed is full to bursting with papers...fear not at this point I was jumping up and down when I clapped eyes on a jug of water that I had paintbrushes sitting in..woohooo...splish,splash,splosh and out it went, phew!! Needless to say it ended up as ashes, the one above was safely done I hasten to add with my trusty heat tool. 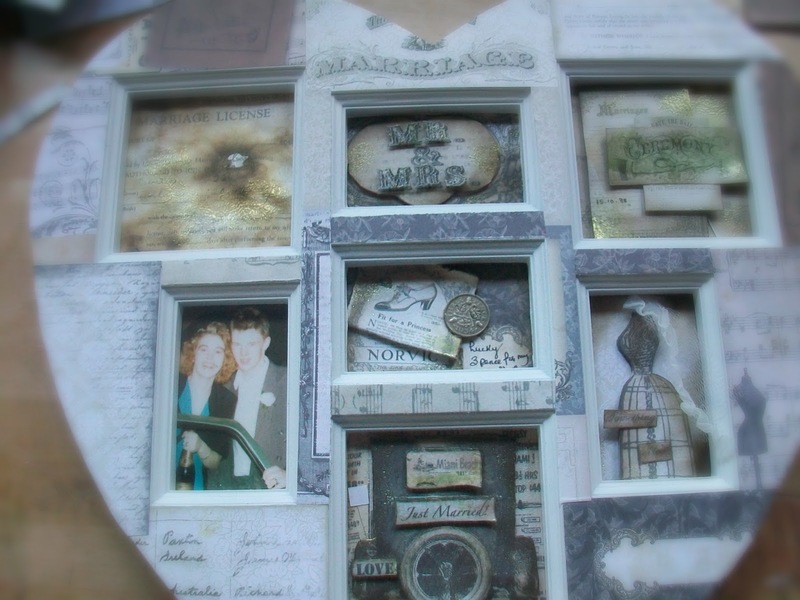 Next, cut up some more papers and make a collage around the frame before adding a few extras . . .
...amazing how after a touch of a little Walnut Stain Ink applied with a blending tool, a few Tim Holtz Remnant Rubs and a dusting of Embossing powders makes such a difference to a project! That`s me and Alex getting ready to go on our honeymoon, I was only 19yr and Alex would be 21yr that week...oh my we thought we knew it all and we were soooo happy! Thank you so much for taking the time to look and I hope I have inspired you to have a go. This looks fabulous, what a makeover. Great use of those papers. This is an absolutely gorgeous makeover and right up my street! I love that it was so Cheap!! You made me laugh so much, Tracy. Do your colleagues in the US have Giddy Aunts too?! I had a shock as I thought you meant it was your marriage license, which might be bad luck to set light to it, then I put my glasses on and realized you meant it was from the paper stash! Beautiful work! Tracy this is absolutely gorgeous. 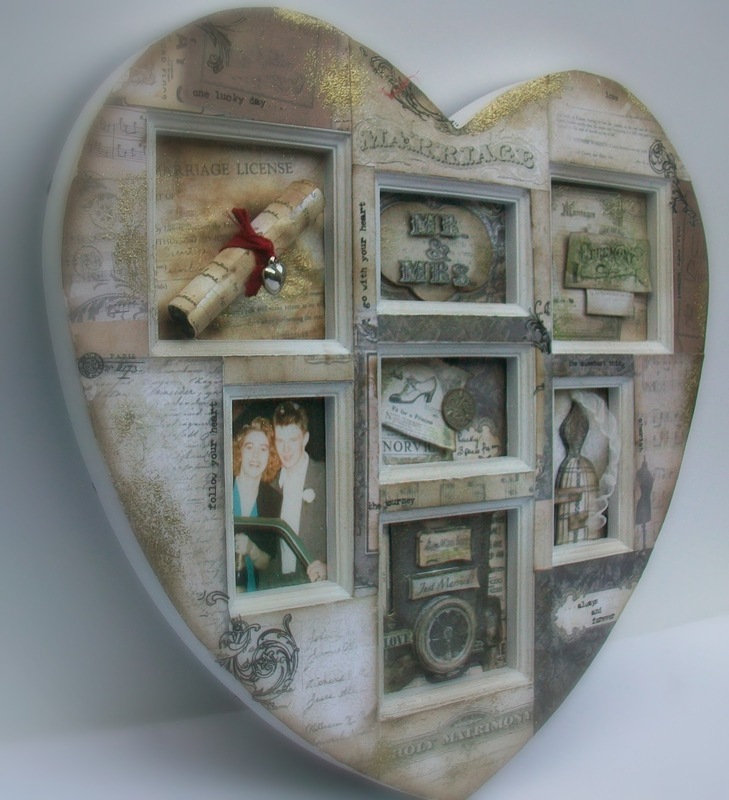 You have done an amazing job transforming your cheapo frame into something that looks a million dollars! Those papers are perfect for a project like this. I love the way you've written your post really made me smile, so glad your little shed did n't go up in flames imagine explaining that one to the fire service! From that cheap frame to a work of art. Fantastic. 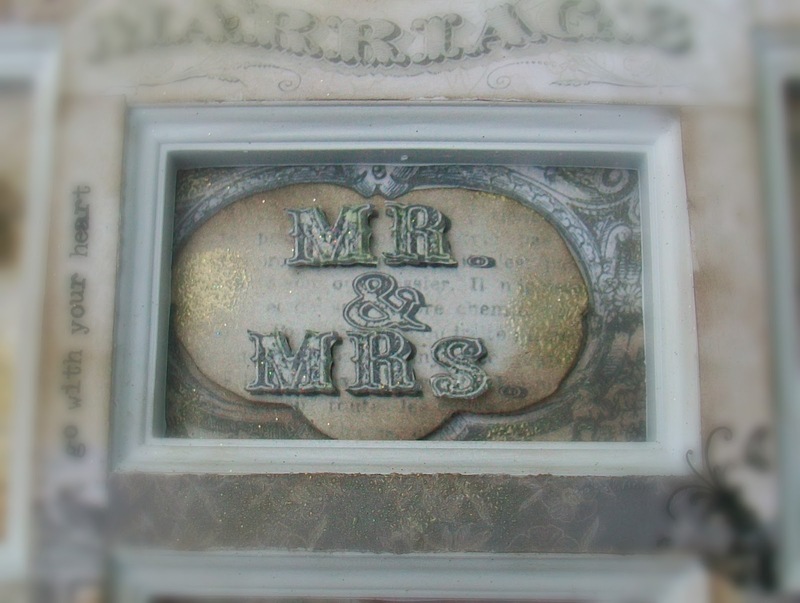 Very entertaining post, especially the fun with the marriage certificate!! Glad no damage was done. Congrats on so many years married. I love the three pence and the story behind it. This is beautiful and amazing, Tracy. I just love this frame and the vintage papers used! Sweet, sweet, gorgeous, gorgeous !!! Not the part about the fire tho! Do be careful !! & not so in a hurry!! Glad you are ok !! What a transformation for the frame. Absolutely Lovely!Thanks for sharing! Awesome project and don't you love cheap finds like that frame? You altered it beautifully. I love shabby, vintage style too although I have a hard time creating that type of style which is why I love your project!!! Wow! This is just drop-dead gorgeous! Stunning project, Tracy! I love all of the details and your stories about the process...you're too funny!! This is beautiful and such a great memory piece!! What an amazing vision you have. The details are stupendous. 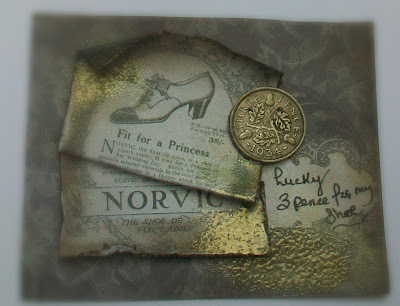 Gorgeous , yes I too love 7 Gypsies papers, they are so awesome... you did them proud !! Oh my word, this is lovely. You have created such a meaningful and gorgeous keepsake of a very special day. I cannot believe the transformation of the unaltered frame to this vintage beauty. So very creative. As always I enjoy your tales of adventure. You are a great storyteller.